Keeping with its high streak with special programmes and events, Universal Studios Singapore announced Halloween Horror Nights 2, weeks ahead of its competitors. 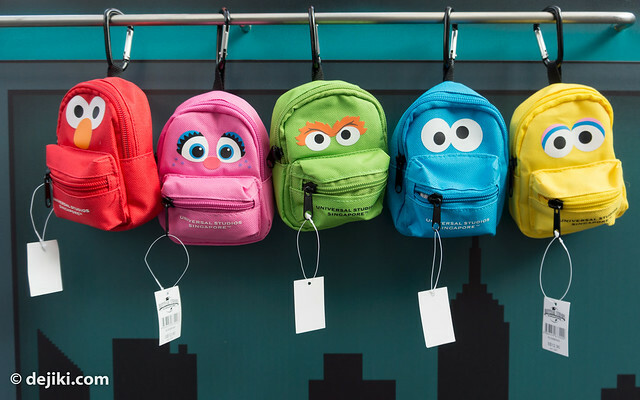 Meanwhile, New York zone is getting more vibrant with new Sesame Street installations. 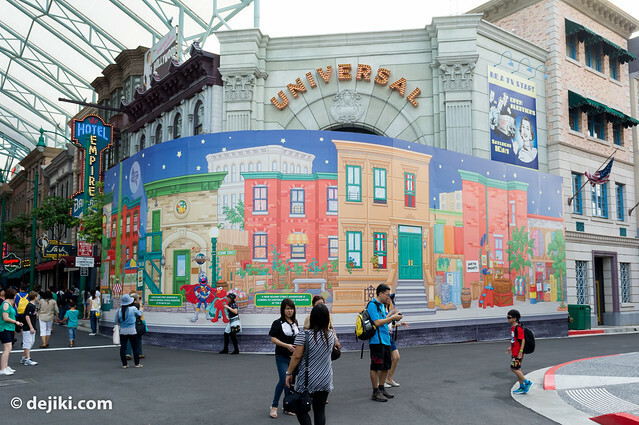 This colourful facade has been installed in front of the ride’s entrance to hide construction work from park guests. 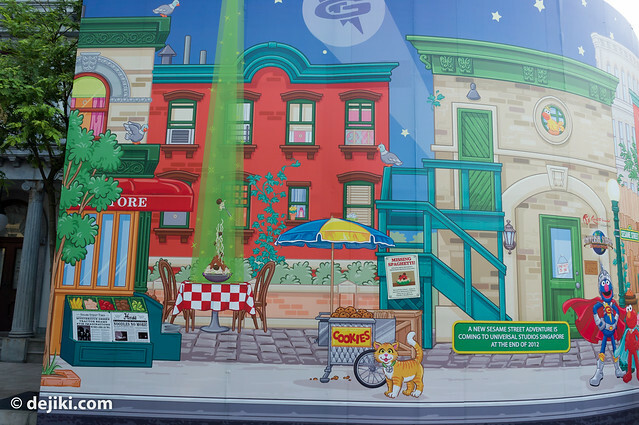 Unlike the Transformers facade last year (which provided guests with no flights of fancy), there appears are several elements in this vibrant installation that could hint or foreshadow what the Sesame Street ride is. It appears that the story revolves around Spaghetti being star-trekked out of Sesame Street by a mysterious villain, and it’s up to Elmo and Super Grover to save the day. 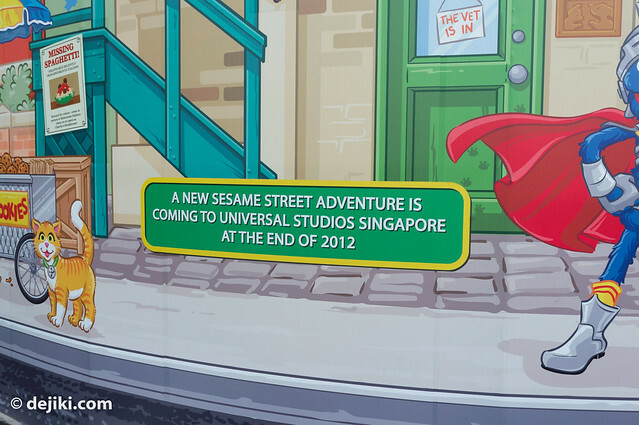 Here it says that the ride will open at the end of 2012. But it gets a little curious – because the “newspapers” on the wall (at the bottom left) are all dated October 21, 2012. It’s a Sunday, and a Halloween Horror Nights 2 event night. There is a chance the ride might open on that day (or another Sesame Street announcement) or perhaps, that’s the day the facade will be taken down. 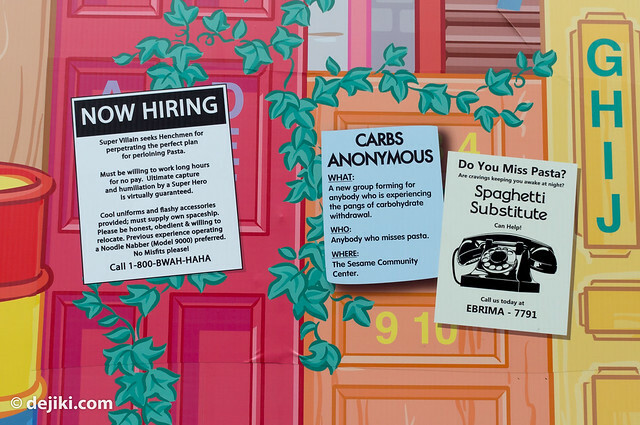 Ironically, within the posters for missing Spaghetti, help lines and other pasta related notices, there is a hilarious ad placed by the villain. All sorts of construction noises can be heard from these building facades. Directly behind them, is Stage 29, which seems awfully small for any type of dark ride (unless we’re expecting Disney’s classic Fantasyland dark rides). Maybe there is some dual-level magic, from Transformers: The Ride? Either way, it will be interesting to see how the park manages the look of this area during the upcoming (and future) Halloween Horror Nights. 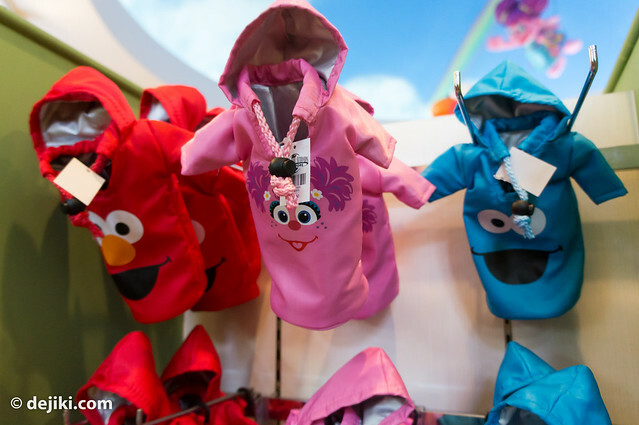 “Hoodies”, or holders for water bottles. Warning! Halloween Horror Nights 2 content below! Halloween Horror Nights (HHN) returns to Universal Studios Singapore this October with more ambitious than last year, promising greater fear-filled experiences with more advanced effects and ambitious concepts. 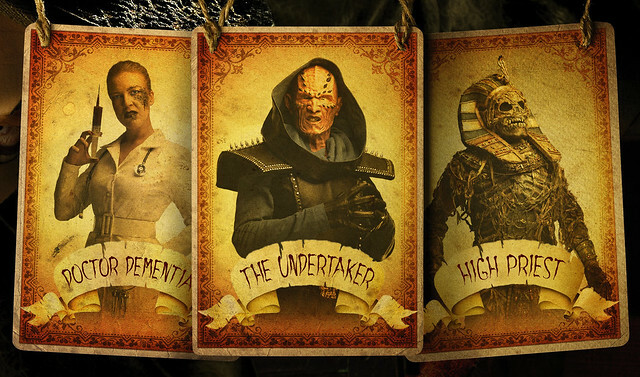 We have a new icon – The Puppet Master, and his three partners in crime – Doctor Dementia, The Undertaker and High Priest. Halloween Horror Nights 2 will take place over seven nights in October: 19, 20, 21, 25, 26, 27, 28. The park will run in HHN mode for four hours, from 8:00PM till 12:00AM. For those seven days, the park have its day-time operating hours from 10:00AM to 6:00PM. 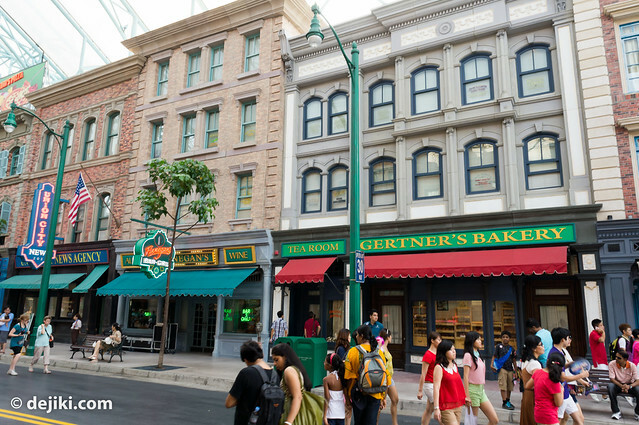 The line-up includes the park’s most popular attractions. The exceptions are some “family-friendly” rides and shows. This subsection has been updated with new information on 30/09/2012. In comparison, last year’s event featured five scare zones and two “haunted attractions” – The Pestilence (Sting Alley) and The Vengeance of the Matriarch (always referred by park staff as the “haunted house). Even if Stage 28 is still available for HHN this year, it’ll be interesting to see how the park crams in another two haunted houses in the space-constrained park. I’ve spotted some construction for one of the haunted houses, which I believe is the The Insanitarium, helmed by Doctor Dementia. This is located at the Waterworld sheltered queue zones. 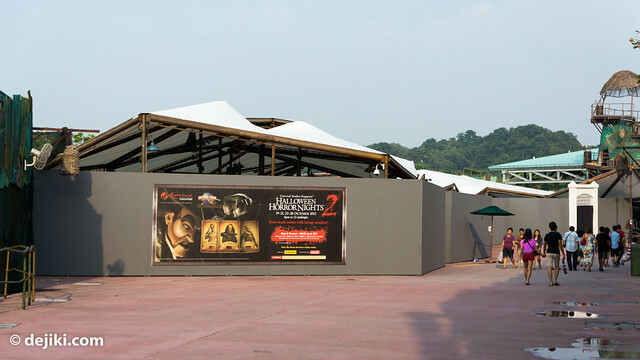 It is possible that the third haunted house, being themed to the Egyptian High Priest, could be located at the unused exterior queue zone for Revenge of The Mummy. Note: You can use your Day-Pass to purchase the discounted HHN event ticket for another night, it does not need to be all on the same day. Receive priority access to three haunted houses and select Halloween Horror Nights 2 attractions. 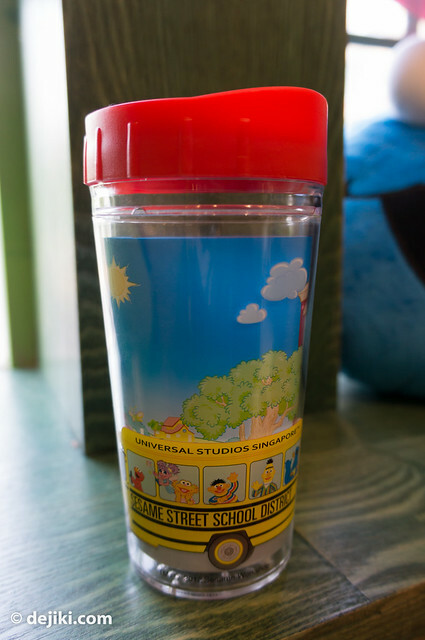 Note: This is not the same as the Day-time Universal Express. You can only use the HHN Express Pass during HHN. R.I.P. Tour features a guided tour through all scare zones, VIP access to attractions as well as other benefits, such as photo opportunities with scare actors and some discounts at F&B and retail outlets. For further information and to buy event tickets, visit RWS website. Tickets can now be purchased from the park, while online purchases will be available from 24 August 2012. As the park announced HHN2 early, detailed information about the event is still scarce at this moment. When new information is available, I will update this entry, as well as another entry where information on all other Halloween attractions in Singapore will be compiled. 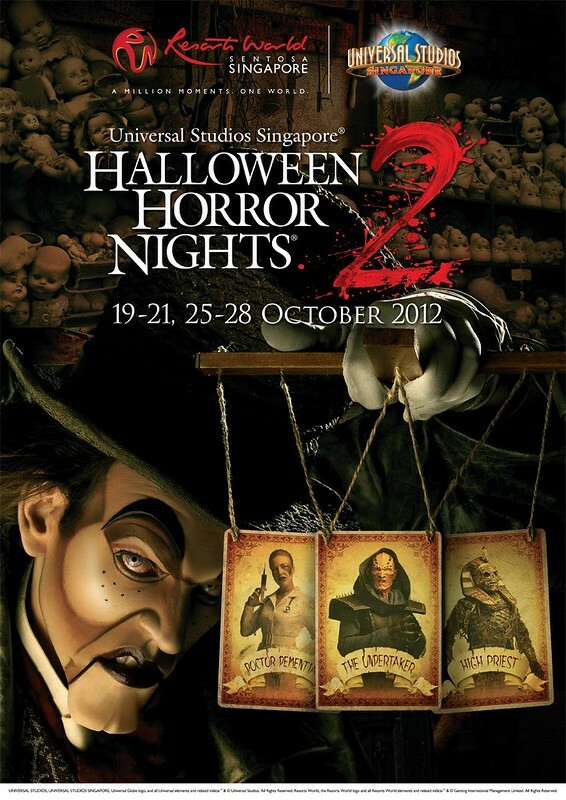 Halloween Horror Nights 2 promotional materials © 2012 Universal Studios, Resorts World Sentosa. I did notice the date Oct 21, but since it’s an event day for HHN 2, I don’t know how I should interpret this. Also I am surprised that so many attractions will be open during HHN this year. However, with the limited 4 hours and three mazes, I find it hard to finish them all like what we did last year. It’s not completely impossible to launch the ride on that day, although it will be tricky to have the New York zone appear “right” for either event. As for HHN, opening the entire park (or most of it) allows the park to accommodate more guests. 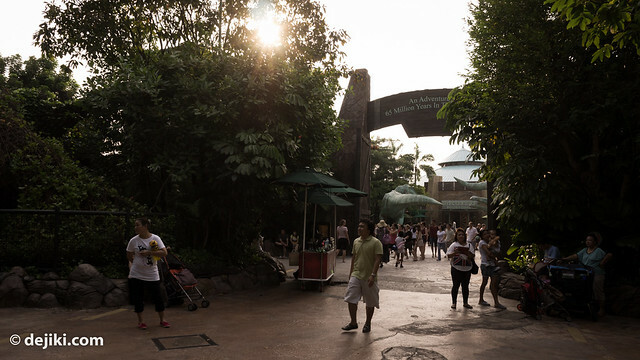 It’s better to offer more than what guests are actually able to experience (than to offer less and leave guests feel shortchanged/nothing else to do), which was an issue last year – it was possible to experience all attractions within 2 hours, if you plan well and arrive early at the park. The wait times may not be as long as last year since guests will be distributed to all these attractions. 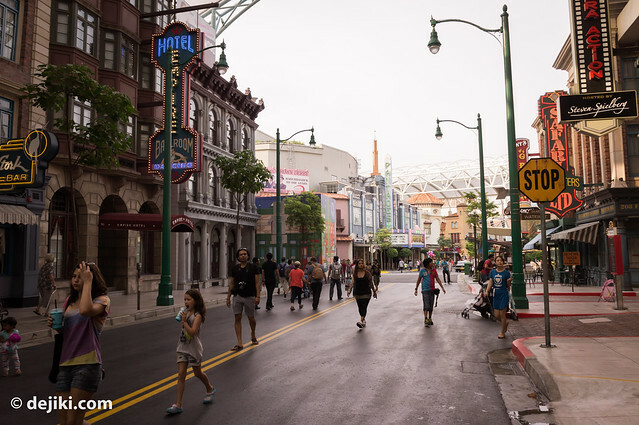 Hollywood Dreams Parade is not likely to be shown during HHN2 season, because the park needs to close an hour early to prepare for HHN. Also, some large HHN props are likely to obstruct the parade route. How do u buy ur tickets so fast??! Where do u buy it from?? Tickets are available online at http://www.rwsentosa.com and at any USS ticket booth! My son learned the ABC’s and 123’s with Sesame St. So I am sure he would like this. This would be the place to go during Christmas Break.